Inside the Phillies: Phillies vs. Red Sox: World Series preview? FORT MYERS, Fla. - The two teams that won the offseason by deploying entirely different tactics will meet Thursday afternoon in a meaningless Grapefruit League game at City of Palms Park. On the home side will be the Boston Red Sox, who fortified one of the best offensive teams in baseball by acquiring slugging first baseman Adrian Gonzalez via a trade with San Diego and rightfielder Carl Crawford via free agency from Tampa Bay. "Hell, yeah, we were excited," manager Terry Francona said earlier this week. "The first day at the winter meetings we got Gonzo. You add a hitter like that, and everybody looks better. The last day of the meetings we sign Crawford. I watched [general manager] Theo [Epstein] and our guys kind of spring into action and our ownership step up to the plate. I was kind of proud, actually. It's easy to say you have a commitment, but that was a pretty big deal." It's not an exaggeration to think that Boston could be the first team to score 1,000 runs since the 1999 Cleveland Indians, who had a hitting instructor by the name of Charlie Manuel. 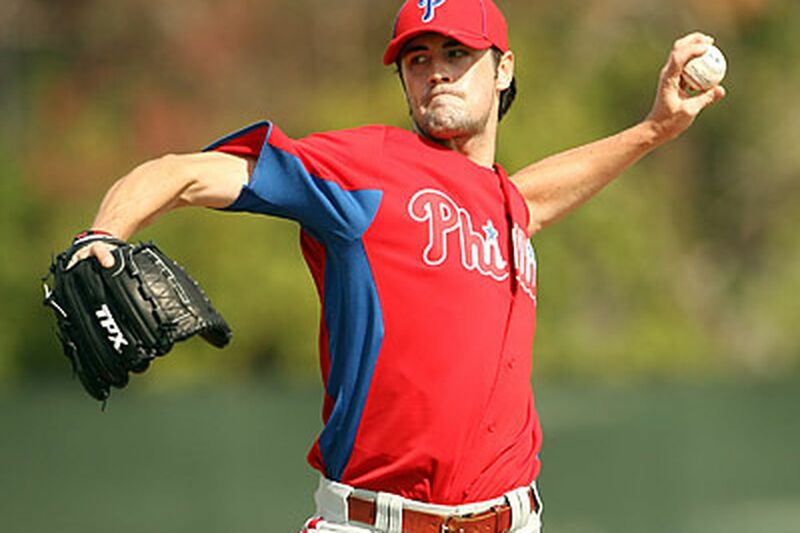 The Phillies will be on the visiting side Thursday featuring Cole Hamels as their ace du jour. Francona was just as impressed with the Phillies' acquisition of Cliff Lee as he was with his own team's offseason additions. "I don't know if coup is the right word, but that kind of came out of nowhere," Francona said. "If you run out their pitching every day, you're going to be good. You give yourself a chance to be good every night." Boston's power bats versus the Phillies' powerful pitchers. No one would be surprised if these teams faced off again in the World Series at the end of October. All we know for sure right now is that they'll play another exhibition game later this month, and the Red Sox will be in Philadelphia for a three-game interleague series from June 28 to 30. "That would be a worldwide event," Red Sox designated hitter David Ortiz said when asked about a Phillies-Boston World Series. During the first week of spring training, Francona was quoted in the New York Post as saying, "I actually think we're better than people think." It was quite a declaration considering the Red Sox are considered the favorite to represent the American League in the World Series. Asked about those words, the former Phillies manager said he believed they were misconstrued. "Every spring we show up, and we obviously have high expectations," Francona said. "To sit here and say you want to win the World Series, I don't know how healthy that is. There is a way to go about it. You have to prepare. To get too caught up in saying we're going to win a certain amount of games, you're missing out on what you need to do. "I know we're supposed to have a good team. I also know that getting to the playoffs is hard enough. But once you get there, there is a fine line between winning and losing sometimes. Nowhere is there more of an example of that than here. We had one foot out the door [in 2004] and a couple of weeks later we were having a parade." That's a good point. On the other hand, there is also reason to believe both the Red Sox and Phillies can be better than people think. With the addition of Crawford and the return of a healthy Jacob Ellsbury, the Red Sox will have great speed at the top of their lineup. The quartet of Gonzalez, Ortiz, Kevin Youkilis, and J.D. Drew will allow Francona's team to match any opponent's power numbers. Playing 81 games at Fenway Park instead of the cavernous Petco Park, Gonzalez should easily surpass his career high of 40 home runs. Crawford and Gonzalez, both Gold Glove winners, should also make the Red Sox a significantly better defensive team. "This team should be built for anywhere," Francona said. "I don't care where we play, we should be able to run the ball down in the outfield, and we have a terrific infield. We should be good defensively, and that should help our pitching." Boston's pitching will determine if the Red Sox are merely good or absolutely great. When the Red Sox won the World Series in 2007, they had the best team ERA in the American League. In the three years since, they have slipped from fourth to seventh to ninth. Part of the problem last season was a shaky bullpen, including a career-high 3.90 ERA and eight blown saves by closer Jonathan Papelpon. A lot will also depend on how Josh Beckett bounces back from the worst season of his career, which included a back injury that sidelined him for two months. Francona knows that even with a loaded lineup, his team could struggle if it does not get good pitching. "If you're short on pitching, that's a hard way to win," he said. "We were fortunate that [Jon] Lester and [Clay] Buchholz took big steps forward last year, and that's exciting. "Beckett had a real tough time, but I've been around him long enough that I like him on our side. I love [John] Lackey, and with Dice K [Daisuke Matsuzaka] I know there have been some inconsistencies, but he won 34 games in two years [2007-08]." As for the Phillies, it has been well-documented that they have the best starting rotation in baseball and possibly of all time. The difference between their being really good and absolutely great rests with the offense. "Don't get caught up in just their pitching," Ortiz said. "They still have a heck of a lineup, too. All they have to do is try to get somebody to replace Jayson Werth, and they're right there. "Those guys have big hitters and, with that pitching they don't have to score more than three runs." Right now, the Red Sox like the Phillies because they signed Lee and kept him from going to the rival New York Yankees. "Oh yeah, I'm glad they got him," Ortiz said. Boston may not feel the same way come late October.